Automated Material Removal | Material Removal Robot Integration - JH Robotics, Inc.
Are you looking for ways to improve consistency or reduce manual labor costs in your material removal process? Automating these repetitive and often menial tasks is a goal leading manufacturers are striving for worldwide. Material removal includes the process of grinding, cutting, de-burring, de-flashing, sanding, polishing or routing manufactured parts. The biggest challenge manufacturers see in most material removal processes is keeping accuracy and consistency. The difference in a manufacturing process that handles material removal in a consistent and accurate manner can be the difference in tens of thousands of dollars in rejected parts. The best way to ensure this process is accurate and consistent is to integrate material removal automation into your manufacturing process. Another major advantage in automating these mundane but important processes is speed. 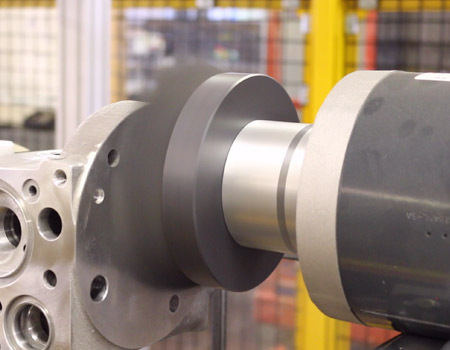 By relying on a robot to quickly de-flash a molded part or polish a surface to the proper finish, you speed up the rest of the production cycle as well. The end result for your company is that product is on the dock and ready to be shipped to your customers at over twice the speed of a non-robotic manufacturing process. JH Robotics has the expertise to integrate the latest technological advancements into your material removal process. Robots now offer optional force sensing devices that can work to apply the appropriate amount of pressure between the part and the material removal equipment to provide precise results every cycle. Material Removal tools designed specifically for robotic use can be utilized and even changed-out for various material removal processes to be performed by a single robot. JH Robotics designs robotic cells with future use and re-deployment in mind – just because you are running Part A for the next two years 24/7, doesn’t mean that if the job runs out, you have a useless robotic cell sitting in your facility – change out the in-feed tooling for your new part, and change the material removal tool on the robot arm (if required) and with a little programming you are back up and running a completely different part. Our automation design process includes a thorough in-house examination of your current manufacturing operations. Items such as payload, ease of integration, speed, and human error are documented along with many other factors that will help our robotics integration experts estimate your cost and time savings in integrating material removal robots. 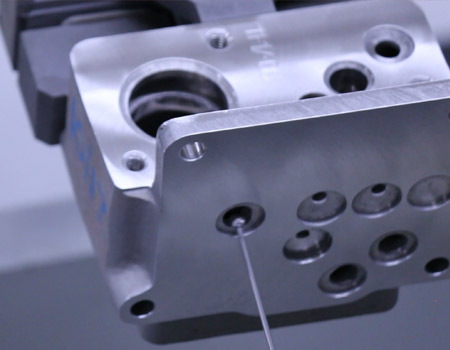 Our unique approach allows us to design a customized system that integrates material removal automation in the most precise of applications. Increased safety by keeping workers away from harmful fumes and dust, and reducing repetitive tasks that often cause carpel tunnel. Wide range of material removal and surface polishing applications possible due to recent technology advancements in robots. Reduced Inspection Labor due to higher consistency, in turn creating a reduction in rejected parts. Happier Customers due to consistency. Our team of engineers, designers and integrators have the experience to successfully integrate material removal robots into your manufacturing process. With over 30 years of experience in the robotics industry we’ve become the experts that manufacturers rely on when it comes to automation. Call us today at 607-729-3758 or visit our online estimate form to get started on making your company more productive, more profitable, and running lean.